We’ve got lots of great events, activities and competitions happening over the Easter holidays, so take a look and see how you can take part. Following on from the success of ‘Norfolk Trails’ Treasure’ last summer, we are holding a brand new photo competition this year with a seasonal theme. How about footprints on a frosty morning or spring flowers peeking through beside a trail? Or what about the beautiful colour of autumn leaves on a path or walkers wrapped up against the cold or enjoying a stroll in the sun? Top prize is a £100 outdoor equipment voucher and your winning photo as a canvas print. There’s also a special under 16s category with its own prize too, so why not get out snapping with the family this Easter? Brought to you by the Norfolk Trails team and Public Health, the Norwich Munzee Trail is a 21st-century virtual scavenger hunt using a free smartphone app called Munzee. 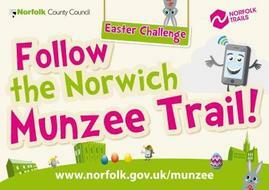 We’ve created a special Easter Challenge as part of the main Norwich Munzee Trail to get you going - hunt down Munzee QR code stickers hidden at 6 of Norwich’s most historic sites. Before you get hunting, download our special Easter Challenge postcard. Our main Norwich Munzee Trail leaflet is full of lots of hints and tips too. When you finish the Easter Challenge, tell us what you thought in our short survey and you could win one of 50 family passes to the iconic Norwich Castle Museum. We’ll be at The Forum in Norwich on Wednesday 1st April to tell you all about it too, so come and see us! 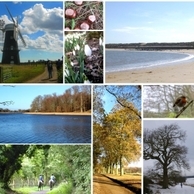 We recently invited people to tell us their ‘must-do’ activities on the Norfolk Trails throughout the year. We were really impressed with the suggestions and have come up with a list of the best 40 ideas. With things to do for adults and families, there’s lots of inspiration to help you enjoy your trip out on the trails. We’ve now added them all to our website and made a handy PDF checklist too. Why not see how many you can tick off the list this Easter? Did you know we now have more Norfolk Coast Path to enjoy? In December 2014 our first stretch of England Coast Path opened, extending the Norfolk Coast Path all the way round to Sea Palling. This takes in some beautiful parts of north-east Norfolk, so why not help yourselves to our free PDF maps and explore the new section of trail this Easter. We want to improve our Norfolk Trails website and would like hear what you think is good and not so good about it. 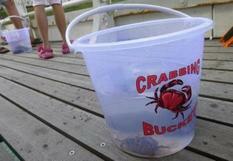 Completed surveys will be entered in to a prize draw to win a £20 outdoor equipment voucher. The survey runs until April 30th 2015. If you’ve got tickets to Spring Fling at the Royal Norfolk Showground on Tuesday 31st March, come and see us at our stall and take part in our activity trail around the site. Spring Fling is a popular day out for families– this year’s event is already sold out!